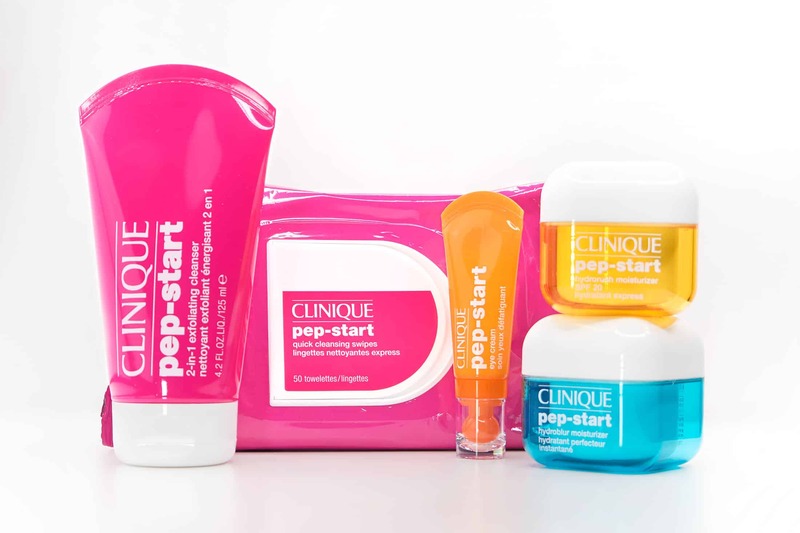 As mentioned, Pep-Start consists of 5 products including the Pep-Start eye cream launched at the beginning of this year. The collection is targeting younger, on-the-go skin that could just do with a bit of a wake-up – look at them like a portable phone charger for your skin. They’re designed for fast lifestyles that don’t have time to use product after product. 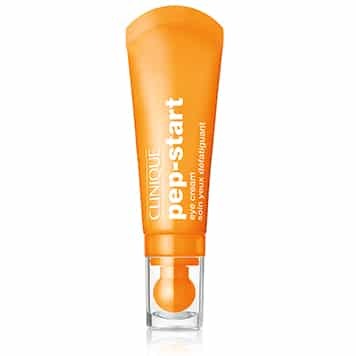 Here you can read my full review of the Pep-Start eye cream from its launch earlier this year. Spoiler: it’s really good! 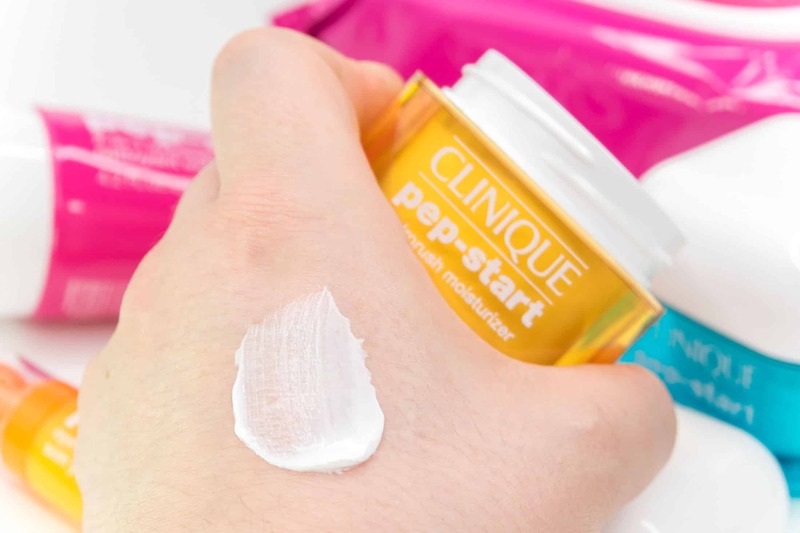 Clinique Pep-Start™ Eye Cream. £22. 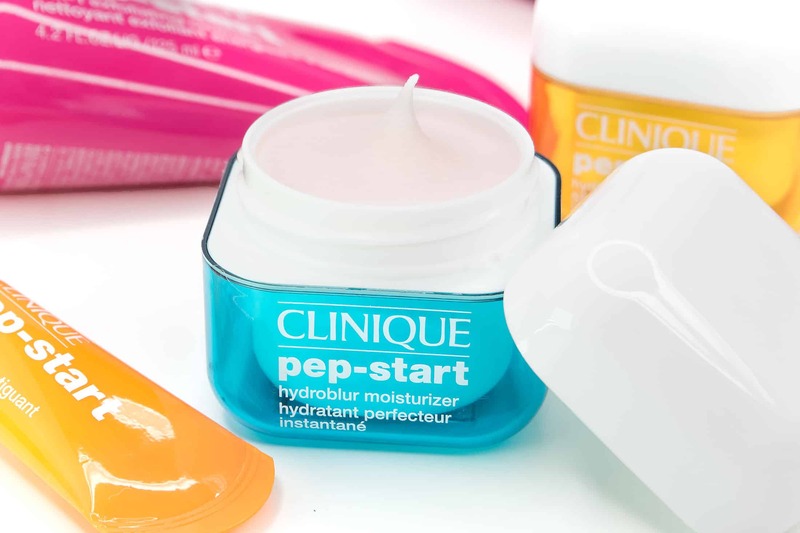 Clinique Online. This oil-free gel cleanser gives gentle, twice-daily exfoliaton that really does a good job at leaving skin smooth. A great idea as I always prefer my exfoliation as little and as often as possible rather than big jolts all in one go. 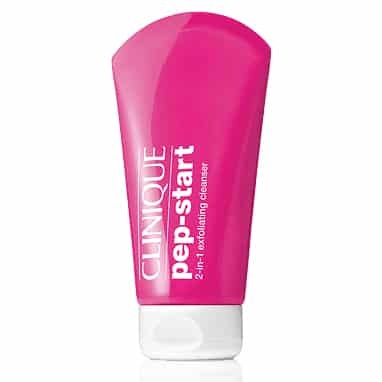 Clinique Pep-Start™ 2-in-1 Exfoliating Cleanser. £16.50. Clinique Online. It also uses gently exfoliation salicylic acid to break down the bonds of surface dead skin cells to give you a complete, multi-level exfoliation but in the perfect concentrations for twice-daily use. The physical exfoliation comes from grains and nut shells, so not an evil-little microbead in sight! 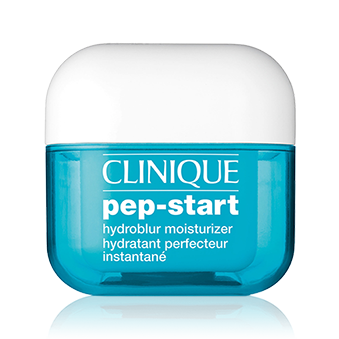 A blend of a primer and hydrator, the HydroBlur Moisturizer gives the best of both worlds in a day product that you can slap on after cleansing when there’s no time to do anything else. It’s completely oil-free and has a thick sorbet-texture. 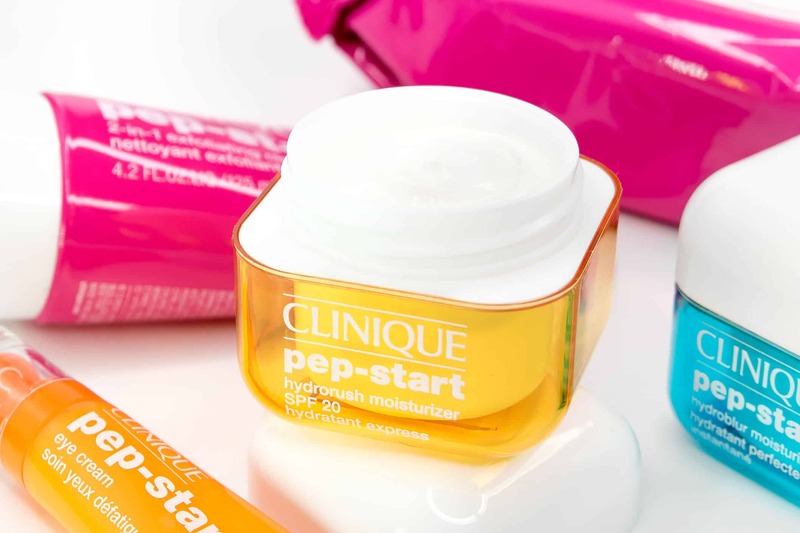 When applied, skin drinks up the hydration while the Clinique HydroBlur technology smooths out lines, pores and wrinkles. Largely Silicone based – nothing feels particularly revolutionary here, but it’s a really solid product! Not only does it work to keep skin looking superficially smoothed out, it works as a great base for makeup, concealers and powders. It just takes out the step of priming and the necessity to always use a base! 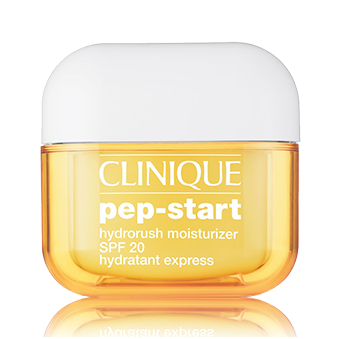 Clinique Pep-Start™ HydroBlur Moisturizer. £24.50. Clinique. 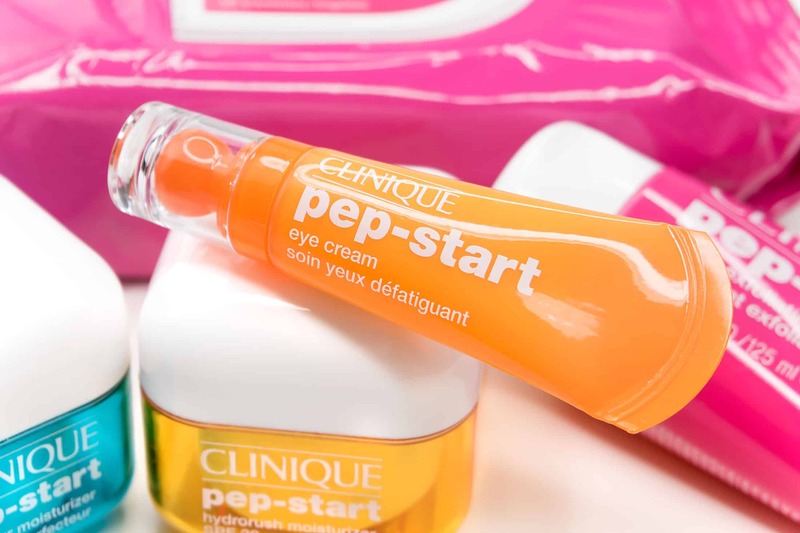 This, along with the Eye Cream, is the best part of the Pep-Start range. Smelling like holidays with its SPF20 UVA/UVB protection (which you should use even in the darkest day in Winter – if there’s sun there’s UV damage!) it gives maximum hydration and the best protection you could need from a day cream. Also loaded with antioxidants and calming anti-irritants, this is a one-stop shop for skin that needs maintaining and protecting. It’s also oil-controlling and oil-free with a light cream texture. This is great for someone in their teens-to-twenties but I’d definitely recommend going for something a little more targeting if you have more specific concerns such as blemishes, dark-marks or ageing. 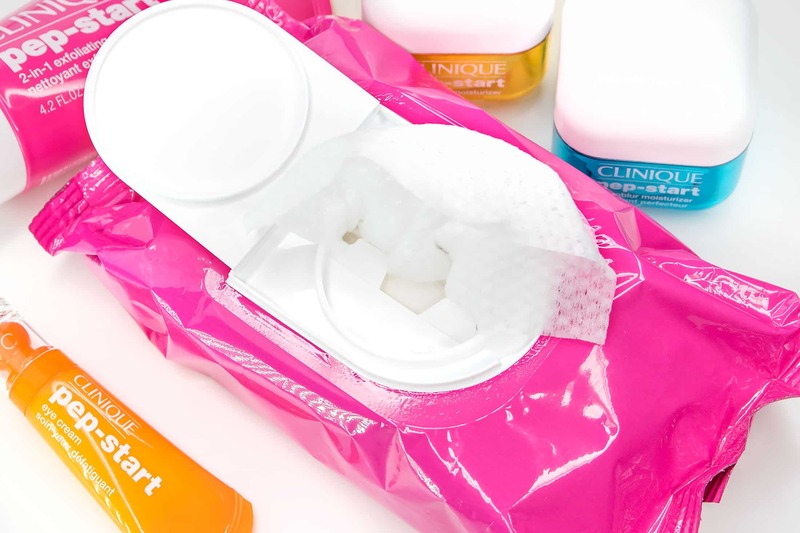 A slightly controversial one, but it seems even Clinique can’t ignore the popularity of cleansing wipes (including their Take The Day Off Wipes). Although they’ve brought these cleansing wipes to the Pep-Start party, they’ve ensured there’s a huge implied asterisks with them. These are not to full clean the skin, nor are they for removing makeup. They’re designed to freshen up the skin on those occasions you just can’t do a full cleanse – think Airplanes and festivals. They’re 100% fragrance free and also provide mild exfoliation powers to remove debris and help unclog pores. Also really great when you’ve finished work, heading out for the evening and want to top up your concealer/coverage. This article first appeared on MANFACE written by Thom Watson. It was published on Sunday 9th October 2016 and was last updated on Monday 3rd April 2017 at 12:38pm. It's categorised under Acne, spots & blemishes, Clinique, Combination Skin, Enlarged / Blocked Pores, Oily Skin, Sensitive Skin where you'll find more related content. I’ve been using this now since it came out (the hydrorush moisturiser), and I do really like it. I’m oil and blemish prone and this has never broken me out even once which 99% of moisturiser’s I try does! My current routine is cleanse and tone in the AM using a Clarisonic smart profile and the Kiehl’s Blue Herbal cleanser and toner (both a godsend for breakouts! ), then Kiehl’s avocado eye cream, a tiny bit of Kiehl’s men’s 24 hour oil absorbing moisturiser on my forehead and nose then finished with the Clinique Hydrorush Moisturiser. Then PM, cleanse and tone again with the Clarisonic and Blue Herbal, Kiehl’s midnight recovery and the avocado eye cream again. Once a week or so I do the Mario Badescu Drying Mask (or whenever I have a spot coming in) followed by a glycolic mask (Nip&Fab do a glycolic fix mask which is cheap but really effective) to keep any breakouts under control. I’m just concerned like you said, that I need something more targeting for blemish/ageing/dull skin! Any other moisturiser/spf recommendations for oily/ blemish prone skin keeping in mind fighting dullness and ageing? Great review Thom. Not a clinique fan but love the colour of the packaging and the cleanser is appealing to me. I didn’t know the hydro rush was oil free. Currently working through three moisturisers and I’m already looking at another haha. Definitely worth a look, the HydroRush is a great all in one!